ATR's SmartProcedures represents the next generation of Procedure technology focused on delivering quality information and work guidance information to the men and women needing convenient access to critical procedures. Conventional word processors require your valuable resources to spend up to 75% of their time manually formatting procedures. SmartProcedures technology alleviates this mind-numbing formatting while providing access to important plant data and process safety information through its award-winning object-oriented database design. Your writers spend less time on formatting and are able to re-allocate this time to improving the procedure quality and access to visual work guidance media for training and pre-job briefings. 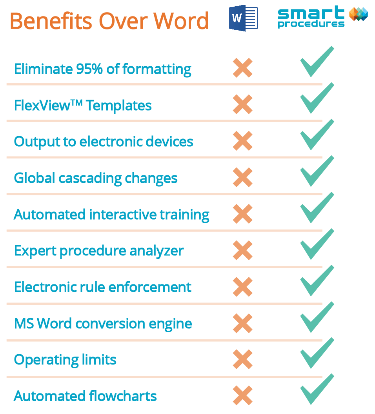 Conventional word processors have serious limitations for procedure development and maintenance. Procedure authors make mistakes that impact safety and waste excessive time because they are not using the right tool for the job. SmartProcedures by ATR addresses this challenge.